Oh how I have missed saying that! Let me rephrase- it has been a few weeks since I have "typed" that!! WHAT THE HECK HAPPENED TO MY BLOG!?!?!? Lauren from The First Grade Diaries ! she had seen in a Hibernation Unit by The First Grade Diaries. The Squirrel couldn't stop thinking about this clip art. She could just feel it. Lauren thought about maybe taking that squirrel, giving her a bow, some lipstick, and a hot little dress. She even went as far as asking what Lauren thought about a makeover for the whole blog. I promise if don't already know her you will fall in love! And now THIS squirrel is going to live happily ever after!!! I have been trying to wrap my head around this year so far. I don't consider myself to be a seasoned teacher in the least bit. This is only year seven for me. WHY THE HECK do I feel like a first year teacher?!?!? CCSS is supposed to be narrow, but deep. could they have made it a little broader on the ol' standard there?? I have "I CAN" statements scrolling at the bottom of all my dreams now!!!! I know I can do it- (because of my wonderful bloggy support team)! Did I tell you that I almost passed out the other day?? I was ATTACKED BY A GIANT CAT!!! WHO THE HECK LET THIS GUY INTO THE BUILDING?!?!? Frame of reference? Look at the very large plant to the left!! I went to the office and had them call a custodian! They said "why don't you just step on it?" I said "because this thing is big enough to eat small birds!!!" WHO THE HECK drives the Shrek- mobile??? If you ever get lost- you may always follow the old standby- "put your hand in your sock"
button that Lauren made for me, too!!!! I have a giggle I can't get rid of because I am so excited about it! You are freakin' hysterical! And I actually know Lauren! I taught with her for a year before she got moved! =( Anyway, She's awesome isn't she!? I love your new squirrel! Totally cute! Your blog looks fabulous! I'm glad that WTH Wednesdays are back! Love the new luck and signature... ADORABLE. I was wondering wth happened to wth Wednesdays. Who the heck said it was my job to make dinner AGAIN! I am going to buy fabric and make that same dress for myself for halloween- think anyone will know who i am? Hey lady, I thought you were supposed to be "unplugged"!! Get back to enjoying your trip!! I wish! Only ten more months til 2 year anniversary- better see you before then, though! Why do sock references get tied into your blog? So funny! Best laugh of the night: [That spider] is big enough to eat small birds! I have "I can" statements for the sixth graders. They are so deep I don't understand most of them! I hope this isn't a year I have to teach, "I can't..."
Wishing you happy Wednesday from California! I did include a very stinky pair of high heels once.....hmmmmm? 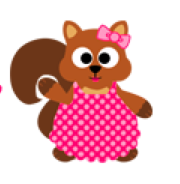 Love the new look - that squirrel is too cute! I missed WTH?! Wednedays - hope to see many more! I just love her work- how have you been??? I have so much to catch up on with Google Reader!! Lauren designed my blog too with some clipart I fell in love with! She's so nice and does a fabulous job! Love the new look! L-o-o-o-v-e the new look! It's so pink, and pink is the BEST. I thought maybe you were taking a nap with the cat. Much more pleasant than being kidnapped. What the heck with the socks and hands? I am laughing my @$$ off!! In love with the new look!!!!!!! And you cracked me up over the nap with no blankie!!!!!! I always am dying when I read your search words!!! Love the squirrel. I love with Wednesday, thanks.